Local press coverage occurs when your business is promoted or discussed by local newspapers, radio or TV stations. To get local press coverage for your small business, find the right local media outlets and pitch an attention-grabbing story. This puts your business in front of a relevant and local audience, attracting new and returning customers. One way to get local press coverage is to send a press release to your local media outlets. Newswire is a simple and intuitive service that helps you write and format a press release and distribute it to thousands of journalists targeted by your industry, location, and more. Click here to get 10% off your first press release. The first step in getting local press is to identify the local newspapers, TV stations, radio stations and websites in your area. Because the number of local media outlets is low, you should try to identify all of them in your county and adjacent counties, including contact information, so you can pitch them later. Create a list of all of the relevant media outlets as you find them. Next, you’ll want to make sure your business is listed in as many online directories as possible to show media outlets that you have a solid online presence. LocalWorks is a free tool that lets you scan local listings across multiple sites, social media, and maps, so you can see where you’re listed and ensure that your information is up to date. Click here to scan your listings for free. A good starting point for finding newspapers is the US Newspaper List (USNPL) which lists newspapers by state and city. You want to identify and reach out to newspapers that cover your city or county specifically. This way, you have multiple opportunities to get your local story covered by a local newspaper. Depending on your business, you may also want coverage in the local college or even high school newspapers. Also worth thinking about are small neighborhood papers or community publications such as church or community center bulletins. To find these sources, ask around, search for Facebook groups or call your local chamber of commerce using this directory. This takes more time but could be worth it if the audience of the publication matches your target demographic. There are more than 15,000 radio stations in the U.S. Chances are, there are dozens of stations whose signals reach your area. Radio Locator identifies what signals reach your area by city or ZIP code. Radio Locator links to each station’s website where you can find contact information. Local news stations need local stories for their programming. Every major network has a local affiliate with its own website and contact information. Look up the television station’s local website and visit its contact page. To find your local channel for CBS, NBC, ABC and so on, enter your ZIP code into the TV Guide website. For example, the local ABC affiliate near my city provides numbers for the tip line, news director, general sales, general manager and press releases. You can use this information to reach out with your unique pitch and business story idea. Local websites are blogs, news sites or even Facebook groups that are dedicated to posting information regarding a specific area of interest in a specific location. The biggest online network of local coverage is Patch Network with individual websites for several hundred neighborhoods and cities. You can search for your “local patch” to find websites that focus on news in your area. For additional local business coverage, The Business Journals has unique coverage of 43 different major urban areas. Furthermore, to find even more relevant websites in your area, do a Google search with the name of your area and the words “news,” “blog” or “event calendar.” This should lead you to websites that deal with topics in your location. There are also many local directories where you want to have your business listed. Now that you have a list of newspapers, stations, and websites that you want to cover your story, it’s time to find the person to whom you will make your pitch. Take the time to find an individual’s contact information at each media outlet, and then reach out to him or her specifically. Use this targeted approach instead of mass emailing a large number of reporters. Search the website: The best place to look is on the “Contact Us” or “About Us” page of the media outlet website. 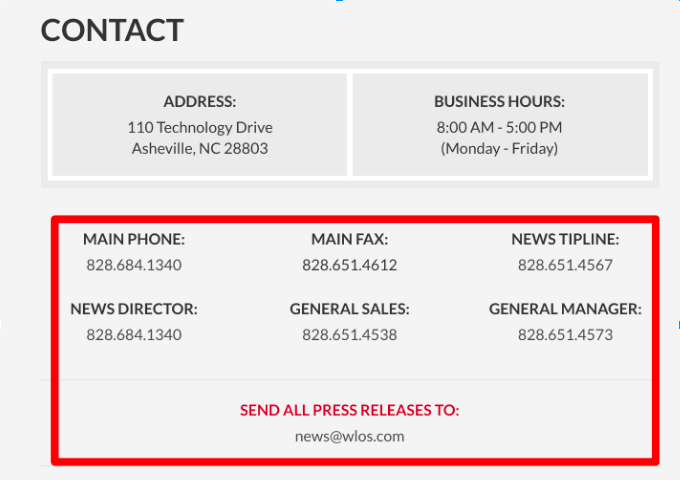 Also, if the contact has written articles for the site, look at the bottom of the article for his or her contact information. Use Hunter.io: Using this system, you can enter the company’s URL and it shows you the format of its email addresses (such as firstnamelastname@XYZmedia.com). 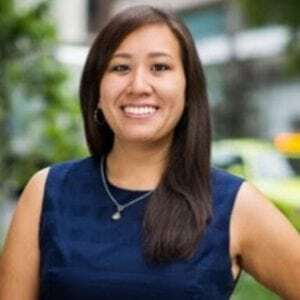 Find on LinkedIn: LinkedIn is a great way to connect with a reporter or journalist. It’s easy to find people by simply searching the person’s full name and where he or she works. Call the media outlet: Sometimes, online research won’t cut it. Pick up the phone and ask for the information directly. You may be surprised at how helpful these companies will be. There are two reasons to stay targeted. First, if the person typically covers stories related to your industry or location, then he or she is more likely to respond to your pitch. Second, because you need to personalize each pitch, you don’t want to spend your time crafting an email to someone who has no interest in your story. While quality outlets are great, so is quantity. This is where a press release distribution service like Newswire can help. Newswire ensures that your press release gets syndicated to a network of over 4,500 business, financial, and news outlets to increase your online and search presence. Sign up and save 10% on your first distribution. Now that you know which person at each media outlet you want to contact, it’s time to make your pitch. Sending out an email is great for initial outreach. Your pitch email should be personalized and interesting, and you should follow up if you don’t receive a reply within five days. Once you make initial contact with the reporter or producer, connecting with him or her over social networks like Facebook, LinkedIn and Twitter can be beneficial. Maintain the relationship even after your story has been published. Once you’ve established this relationship, it’s likely that he or she will be receptive to covering your local business when you have something newsworthy to announce in the future. Personalized: She addressed the email directly to someone on our staff and also referenced one of our staff member’s colleagues that I had been in contact with. Interesting: The first step is an intriguing subject line so that the email gets opened. She does this with the subject line. 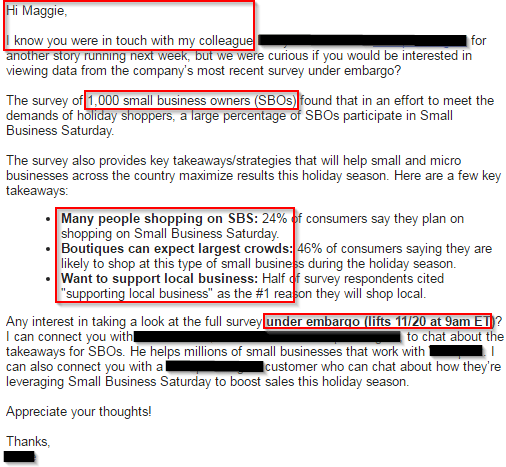 In the body of the email she is able to answer the following questions: 1) Why should I be interested? ; 2) What are the key points? ; 3) Why do I need to act fast? ; and 4) Where can I get more information? Persistent: When our staff member didn’t reply immediately, the reporter was persistent and followed up with her five days later. When journalists respond to your pitch, be prepared. Promptly reply to their inquiry, identify what they want to discuss, practice for an interview if necessary and provide visuals or music if the inquiry is for radio or TV coverage. Often, journalists have a specific angle they want to approach, so don’t be surprised if the conversation takes a different direction than you were expecting. Some journalists may want to get answers to basic questions via email. Sometimes, they’ll want a quote, clarifying details or some facts about your business. This is usually the case if a journalist is reporting on your press release. If the journalist requests an interview, ask what he or she wants to discuss beforehand. This helps improve the overall quality of the interview since your answers are likely to be higher quality and more detailed if you can anticipate or prep for them. Journalists often have an agenda going into an interview, so be prepared to satisfy their needs. The press might want to be able to interview a couple of clients for the story, take pictures or visit parts of your facility. You want to be prepared for these types of requests. If you’re doing an interview, write down the question that you expect to be asked and role-play the interview with a colleague or friend. For online or newspaper stories, you should be ready to provide a number of high-quality photos of your storefront and customers using your products. For radio coverage, you should offer a sound background to enhance the story. If you need inspiration when trying to craft a newsworthy story that you can pitch to your local media outlets, we have an existing article on the top 40 press release examples from the pros. In the article, you’ll find a range of examples on how exactly to write an attention-grabbing piece of news. For a complete list of press coverage tips, check out our article on the 40 press release examples from the pros. How Do You Get Local News Coverage for an Event? To get coverage for an event, follow the same process as you would for any seeking any other type of coverage — find relevant media outlets, target the right contacts, craft your pitch and be prepared for a positive discussion. For the best chance of getting coverage for your event, be on the lookout for newspapers, publications, Facebook groups or even coffee shop bulletin boards. Reaching out to these curators, managers or proprietors may allow you to publicize your release through other outlets. Should I Ever Pay for Press Coverage? You should only pay for advertising or for services such as a press release distribution service. Ethically, journalists should never receive any form of remuneration for providing press coverage. As a small business, there are plenty of free press coverage opportunities when wondering how to get a story on the local news. How Do You Get Press Coverage for a Startup? To get press coverage for your startup, reach out to the business-focused publications and journalists. Call your local chamber of commerce to see if it has methods of announcing a startup within the business community. Learning how to get a story on the local news is a time-consuming process but, if you follow the process, you can get press coverage that drives more sales for your business. By spending a little more time to find the right media contacts, form relationships with them and craft the perfect pitch, you have a higher chance of getting press coverage and also of being a source for reporters in the future. Don’t forget to check out Newswire when you’re ready to distribute your press release. You get access to thousands of media outlets and journalists targeted by industry, location, and more. Click here to save 10% on your first press release. Daniel Threlfall is a digital marketing strategist, content creator, and small business advocate. In his decade of experience in marketing, Daniel has been able to engineer a viral blog for Neil Patel, refine the marketing approach of Noah Kagan, create content for Hiten Shah, lead international website expansion for Fiji Water, and consult for Shopify. Daniel’s passion for writing has allowed him to publish content on Forbes, Entrepreneur, FastCo, Smashing Magazine, Harvard Business Review, Washington Post, Business Insider, The Times, and other niche publications. Daniel and his spouse, Keren, run a local real estate business in South Carolina. Their four kids watch, learn, and sometimes help out. Lovely article. This was very well written and insightful. I’m much more inclined to give a story or press release in our newspaper if they advertise with us. If they don’t support us, chances of me helping support them is unlikely. Hi, I have very new pet loss card business that I’m trying to get exposure for. What advice would you give as far as what kind of media to reach out to? It seems like news stations wouldn’t be the right direction for the type of business I have. Any advice would be appreciated. We can offer you these articles to help market your business. Thanks so much for the time and effort you took in providing such valuable marketing information. You presented all of the information in such a clear to understand format which also was evidence of your expertise in effective, up-to-date marketing strategies. I’m satisfied with your all points and they all are valid and genuine, but I wanted to know one thing how should I take the help of Radio Advertisement to promote my business? Not sure if this is helpful, but I worked for a short time in radio. Most radio stations will have an email address or fax, and sometimes they’ll do public service announcements or press releases at no charge. (However, if they think it’s advertising, they’ll send you to the sales team instead.) If you’re in a small market, you’d be surprised, radio ads can sometimes cost less than the newspaper! I’ve attached a few articles you may find helpful. And PS, don’t let the radio sales exec scare you. Just let them know your budget, and if you don’t like their rates, move on. Best of luck to you! Share your press release with over 1.7 million journalists!